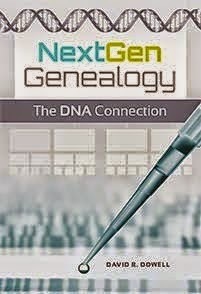 When genealogists began to apply DNA test results to family history, they had the opportunity and responsibility to set standards—not for laboratory procedures, but for acceptable linkages to individual documentation, ethics, and interpretations. It was an opportunity missed. Had they been established, such standards would have set boundaries to embrace the power of genetic testing and, the same time, to avoid abuse. As difficult as it is to cite, describe, explain, or utilize this rapidly evolving tool, the real DNA-test quagmire is ethical. With no established standards, editors face a conundrum when considering articles from DNA-test participants. Do they publish results that might affect relatives who have not released rights? When a DNA profile becomes as easily recognizable as a cursive signature, who has what rights? However their implication that genealogists, by being more proactive, could have influenced the practice of DNA identification in the criminal justice system seems far fetched. The editors acknowledge that "widespread understanding of the capabilities and limitations of DNA testing lags behind technological advances." This pattern has been repeated over and over again with all technologies probably going back to the appropriate use of clubs in the age of the cave clans. Was it OK to use it on game? Was it OK to use it for self defense? To control others? In more recent times the Internet developed far faster than our abilities to anticipate and understand how it should be used. In the last quarter century, no areas of science and technology have expanded faster than the Internet with the possible exceptions of astronomy and genetics. It is not in our ability or interest to try to stop these developments while we figure it all out. None of us have the ability to anticipate all the possible implications of developments in these fields. If we were that clairvoyant, we would be frozen into inaction by all the possibilities. But I suppose that inaction has occurred anyway. right to protect our communities. Should NGS have a role is discussing and providing guidance in appropriate practice? Should ISOGG? You bet! "Ancestry by DNA" Offers New Tests --- But What Good Are They? One seems to be intended to look similar to the autosomal test Ancestry.com has been offering since 2012. It is not by accident that this offering looks like Ancestry.com. Brand confusion seems to be by intent. The 15 customer reviews on Yelp gave Ancestry by DNA a generous 1.5 stars out of 5. 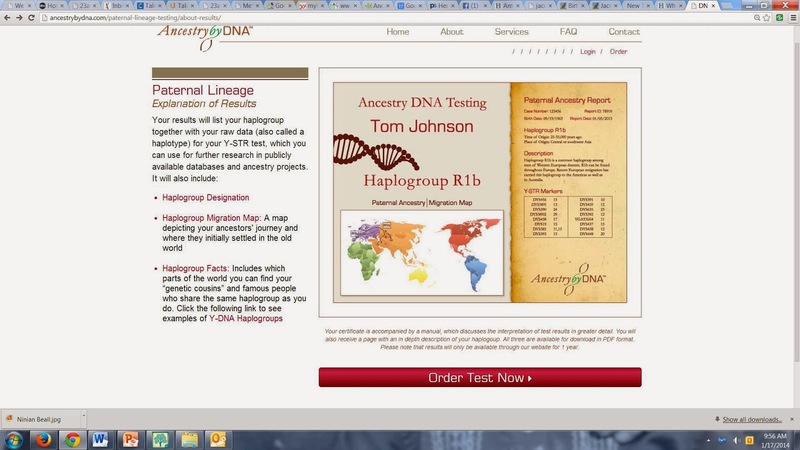 Lineage testing can determine your Haplogroup which can show you how your ancient ancestors migrated out of Africa and what route they took on their journey to where you call home. Halpogroups are determined by analysing the DNA that is passed down from either your paternal or maternal side and can be traced back over 100,000 years. Your results will provide you with your Haplogroup, map, and guidebook for beginning your journey of self-discovery through DNA. It is hard to see what the bargain is even at 50% off. Some STRs values are to be provided to males who test; but it is unclear how many. There seem to be two or possibly 3 levels of mtDNA results offered. What one gets at what price is also left open to guess. It is clear that the price for a full mtDNA test may be $199 (US) but does the 50% off apply to this? Your certificate is accompanied by a manual, which discusses the interpretation of test results in greater detail. You will also receive a page with an in depth description of your haplogoup. All three are available for download in PDF format. Please note that results will only be available through our website for 1 year. So if you take this test, be sure to download them promptly. This is a flashy website; but what are we being offered? Check it out and give me your take. What are we being offered and at what price? Dr D can think of no reason why persons serious about their family history would be benefited by any of these tests. 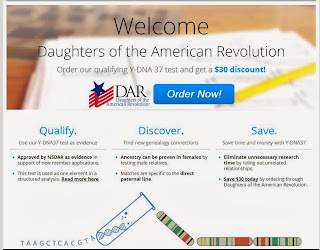 Ancestry.com, FTDNA and 23andMe all offer far more useful information at comparable prices.